Diabetes, a group of conditions in which the body can’t properly regulate blood sugar, affects roughly 30 million people in the US — about 9% of the population. In a new report by the CDC, researchers found that while the rate of new diabetes diagnoses in the US has stayed steady, the disease is still a major public health issue across the country. 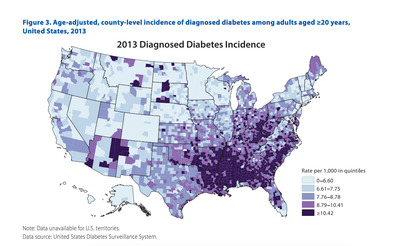 Diabetes was the seventh leading cause of death in the US in 2015. “Although these findings reveal some progress in diabetes management and prevention, there are still too many Americans with diabetes and prediabetes,” CDC director Dr. Brenda Fitzgerald said in a news release. Those cases are disproportionately spread around the country. 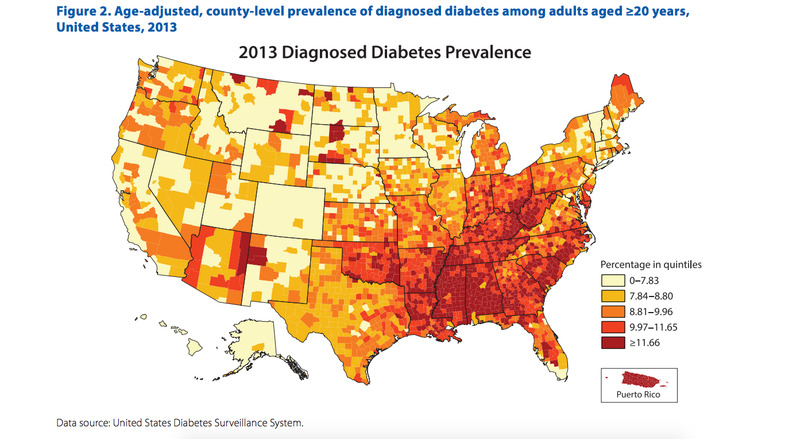 The map below shows where people with diabetes live across the US, with the darker red shades representing areas where a larger percentage of the population has been diagnosed with diabetes. Areas with the highest concentration of cases are southern states like Mississippi and Alabama, along with Puerto Rico, a US territory. In those locations, diabetes was prevalent in more than 11% of adults over 20. When it comes to new diagnoses, the states with the highest rates per 1,000 people are also in the southeast, as well as parts of Ohio, Kentucky, and West Virginia. Information about where diabetes prevalence is highest can help public health officials figure out where to devote the most attention in their attempt to bring down the number of cases nationwide.